TOKYO--(BUSINESS WIRE)--NTT DATA (TOKYO:9613), a leading IT services provider, announced today its launch of “AW3D Telecom for 5G,” an advanced 3D digital map package that leverages high-quality satellite imagery for the planning of fifth-generation (5G) wireless networks, effective immediately. AW3D for 5G is expected to be used by telecom carriers, network vendors and IoT companies engaged in businesses involving 5G networks. Commercial 5G services via fixed wireless access networks launched in the USA in 2018 and will begin operating in Japan, South Korea, the UK and Australia in 2019. Accurate 3D models are crucial for designing 5G networks, which use millimeter-spectrum waves that are highly sensitive to interference from natural and manmade objects. Buildings, trees, bridges, flyover roads, etc. need to be expressed precisely in 3D models and incorporated in network-planning software. Highly accurate and detailed 3D digital maps also support on-sight investigations and the optimal placement and tuning of network infrastructure. 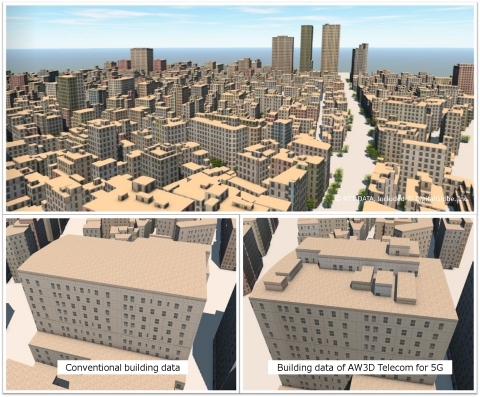 NTT DATA, a leading provider of global elevation data with its AW3D series, has designed AW3D Telecom for 5G to work seamlessly with standard wireless network design software used widely for radio frequency (RF) simulation purposes. It expresses buildings, trees, bridges and other objects in vector format and digital elevation models are offered with 1m- or 2m-resolution in raster format. The new solution incorporates NTT DATA’s multi-view technology, which uses more than 10 images to calculate each elevation and an advanced machine-learning algorithm supported by artificial intelligence (AI) for image processing. It enables the capture of detailed objects, such as structures on building roofs and individual trees on streets, to build advanced datasets for highly precise 5G planning. In the future, NTT DATA will expand the market for AW3D Telecom for 5G to companies offering IoT, autonomous driving, drones and virtual reality products and services that depend on 5G networks. NTT DATA will provide such companies with complete solutions to help them develop more sustainable and future-proof businesses and expand their use of geospatial information in new markets. NTT DATA will present AW3D Telecom for 5G at MWC19 Barcelona from February 25 to 28, joining other NTT subsidiaries and affiliated companies in Hall 3, Stand 3D31. Clutter, digital land use (DLU) Land-use classification map for analysis of radio propagation and deviation. Base map - from 2.5m - SHP, etc. AW3D is the world’s most precise, pre-produced global digital elevation model covering all land spaces with 5-meter resolution, developed and sold jointly with the Remote Sensing Technology Center of Japan (RESTEC). AW3D has been used in over 800 projects in more than 100 countries across the globe mainly in emerging countries in Asia and Africa, contributing to infrastructure, disaster prevention and much more. “AW3D” is a registered trademark of NTT DATA and RESTEC in Japan, and a registered trademark of NTT DATA in Europe (EUTM) and the United States.